Composed by Wolfgang Amadeus Mozart (1756-1791). Arranged by Ray Thompson. Classical Period, Anniversary, Birthday, Wedding. Score, Set of Parts. 21 pages. Published by RayThompsonMusic (S0.98819). String Quartet No. 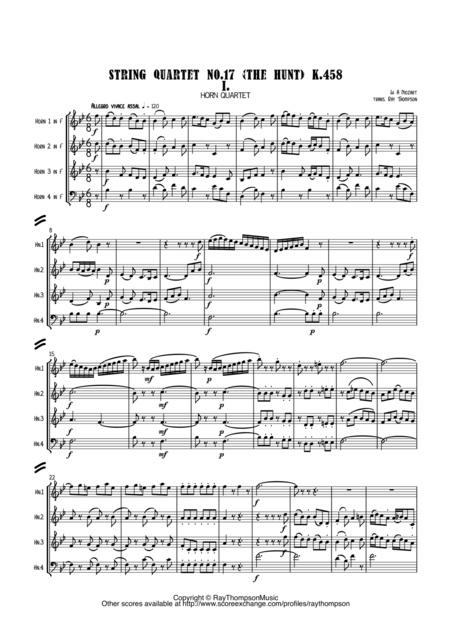 17 in B-flat major, K. 458, nicknamed "The Hunt", is the fourth of the Quartets dedicated to Haydn. It was completed in 1784. It is in four movements: 1 Allegro vivace assai 2 Menuetto and Trio. Moderato 3 Adagio, in E-flat major 4 Allegro assai. Neither Mozart nor Artaria called this piece "The Hunt." "For Mozart’s contemporaries, the first movement of K.458 evidently evoked the ’chasse’ topic, the main components of which were a 6/8 time signature (sometimes featuring a strong upbeat) and triadic melodies based largely around tonic and dominant chords (doubtless stemming from the physical limitations of the actual hunting horns to notes of the harmonic series). 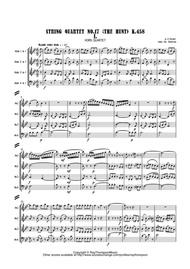 I have arranged the 1st movement for a horn quartet, as well as transposing it into Eb. This suits the range of the horn. It would be impossible to transcribe for natural horn so I have left the parts for horn in F, with a key signature. Quite a long blow: i have transcribed all the repeats but it practise they could/should be omitted. Hn 4 in bass clef (new notation) throughout. I will add a treble clef idc. Hn1/3 requirea good technique to cope with runs! I suggest a steady Allegro, rather than a Vivace!.